With company mergers an ever-present feature of daily business life in Europe and the wider world, it is essential that practitioners' legal, corporate and financial become familiar not only with the regulatory law governing merger activity but also with the growing body of case law embodied in the decisions of the European Commission. EC Merger Decisions Digest is the resource that all business people and their advisers will use for this knowledge and information. There is no better tool for rapid and efficient analysis of prospective mergers. a user guide to obtain maximum and speediest benefit from the work. The text is in English, even if the language of the original decision is not. Practitioners and advisers from the diverse sectors of corporate and competition law, investment banking or private equity will quickly find information relating to the product and geographic market definitions upheld by the Commission, and readily understand the principles underlying the Commission´s findings. Users will rapidly find the most important decisions in each sector, obtain the key facts, and identify the reasons underlying each decision. Each summary contains full reference citations to the original text of the decision. With the Digest, practitioners and business people can be confident of uncovering every potential pitfall and considered every advantage possible in the circumstances of any deal, right up to the last minute of the process. 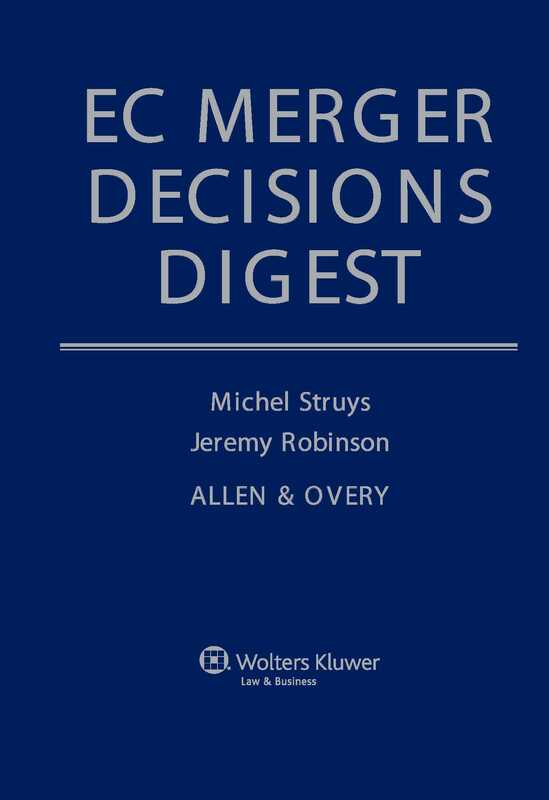 With its regular updates, economic sector focus, and uncompromising practical orientation toward M&A practice, EC Merger Decisions Digest is the only product of its kind in any format. It would be hard to name an item in a European company law library that will get more use, day in and day out, for years to come.